Most expats come to love Korean food and, at the very least, tolerate the Koreanized versions of international cuisine. Sometimes, though, corn on pizzas, sweet spaghetti sauces and kimchi on hamburgers just don’t hit the spot when we need that taste of home, or just somewhere else! With the constant expansion of international cuisine on Jeju, there are now more options than ever to tantalize your taste buds. While we can’t offer the global cuisine of Itaewon, things are changing fast. So, here is The Weekly’s guide to the best global options around the island. Located in Shin Jeju, Burger Trip is owned and operated by Joonho Lee, a well-traveled chef who has now settled on Jeju Island. 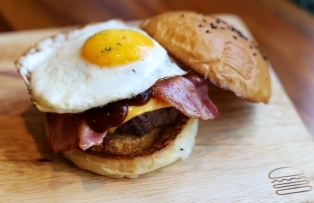 In addition to its industrialized interior, Burger Trip dishes up a mouthwatering assortment of burgers and pasta. With aloha, viva! Mexico, and Mt. Halla burgers as well as the bruschetta chicken burger, an assortment of potato wedges (including chili cheese!) and real milkshakes, this spot is top notch for burgers on Jeju. Tues – Sun: 10:30 a.m. – 9:30 p.m. If you’re in the City Hall area and craving a hearty burger, make your way to Harry’s Pub. The comfortable couches, Canadian and American blankets, and vintage decorations, really make you feel like you’ve stepped into a North American pub. An array of burgers is available as well as great beer specials (including a hazelnut beer!) and the pièce de résistance, chicken wings. That’s right, wings. Jeju’s original taste of India, Bagdad Café has the quiet ambiance, the mood-setting music, and the embracing smile of owner Hyun Juryoung to make any visit to this City Hall establishment enjoyable. With a variety of curries, including halal options, lassis, and a delicious chai tea, Bagdad’s chefs continuously provide an indulging and delicious curry in a warm atmosphere. Mon-Sat: 11 a.m. - 1 a.m. (closed Sundays) / kitchen closes at 11:30 p.m. 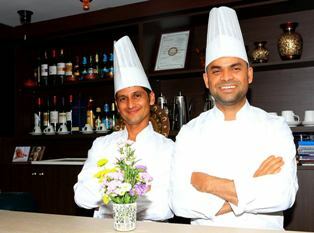 Located in the Jewon district of Shin-Jeju, Raj Mahal is another Indian option. The menu is vast and includes delicious onion bhaji appetizers and spicy vindaloo curries. Lunch specials are also available (11 a.m.-1 p.m.) which include a variety of dishes including salad, yogurt, curry, and naan, albeit in smaller portions. Prices: Curries are 10,000-13,000 won. 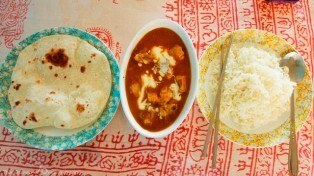 Set amidst the gorgeous backdrop of Gwakji Beach, Curry Walla is Jeju’s newest curry spot. Owner and chef Dawa - trained in India after leaving his Tibetan home - offers a satisfying menu of a chicken curry, chapati, naan, and chai tea set that is sure to satisfy your curry cravings. Watch this space for traditional Tibetan "momo" and kebabs in the near future, too! Tues-Sun: 12 p.m. to 6 p.m.
Pizza could be the most common non-Korean food, yet the corn and potato toppings, complete with sweet-potato crust. just don’t satisfy everyone’s pizza lust. Dalgrak Pizza is a different ball game, however. These thin-crust, oven-baked pizzas are topped with cheeses, veggies, and meats full of flavor and should even satisfy deep-dish aficionados. Prices: Pizzas range from 12,000-16,000 won. Tues - Sun: 11:30 a.m. - 11 p.m.
Café Taehee, mere meters from the blue seas of Gwakji, provides beach-goers with brunch, lunch, and dinner options. The specialty is chef Kim Taehee’s fantastic fish and chips platter with melt-in-the-mouth fish, light and crispy batter and chunky homemade potato wedges. Also serving an egg, bacon, and muffin brunch platter, and beef and chicken burgers, this quaint café definitely pleases the palate. 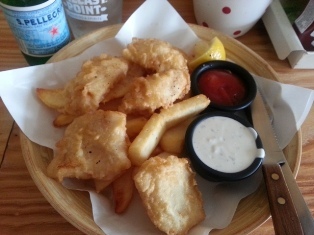 Prices: 12,000 won for Fish and chips and 10,000 won for a "Taehee Brunch"
A newish addition to Jeju’s international scene is Ates Turkish Pub on Baojian Street, Shin Jeju. 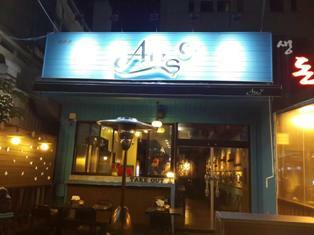 Opening in fall 2013, Ates has quickly become a popular choice for expats and locals for a tasty international treat. A wide selection of kebab wraps and platters as well as traditional Turkish coffee and lassi drinks make Ates ideal for a quick bite or a dinner date. Prices: Basic kebabs are from 4,000-6,000 won. Traditional "home-style" kebabs are 12,000-18,000 won. Mon-Sat: 5:00 p.m. - 2:00 a.m. This new restaurant serves original-style Thai food cooked by its four Thai chefs with more than 10 years experience in their homeland. The building has an airplane theme with a unique, somewhat luxurious feel. Prices are accordingly not cheap, but it is perfect for a romantic date or special occasion. 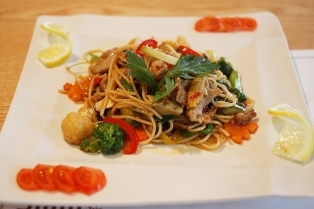 Prices: Basic noodle dishes are 9,900 won, with chicken and cashew nut set to set you back 20,000 won. Mon - Sun: 11 a.m to 9.30 p.m.